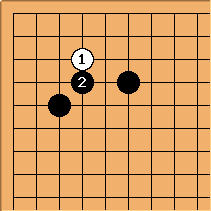 White can invade this way and live - as shown, it is the standard tenuki line of the taisha: see taisha tenuki variations. 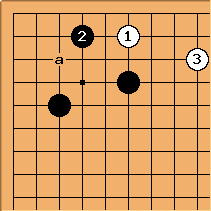 Black, however, will develop much influence. Another 'common' way to play against this rare formation: on the second line makes defend the corner space: and a are effectively miai. 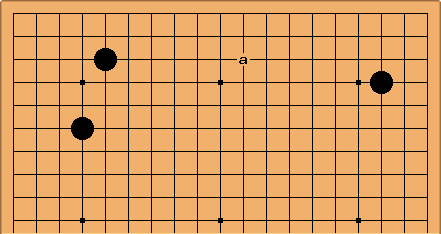 This has occurred in a few pro games, being played by O Meien in 2001. 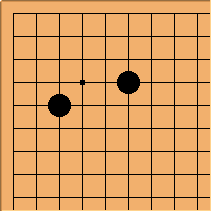 In that game White (Hikosaka Naoto) played a wedge at a. 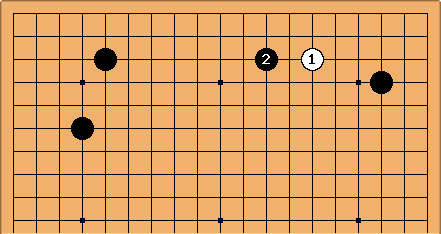 In an earlier game Rin Kaiho-Yoda Norimoto (B) 1998-08-06 White played the distant low approach and was a pincer (unusual: see enclosure opening distant low approach, pincer). O Meien also played this enclosure-pincer combination against Lee Sedol in the 3rd CSK Asian cup in 2004.